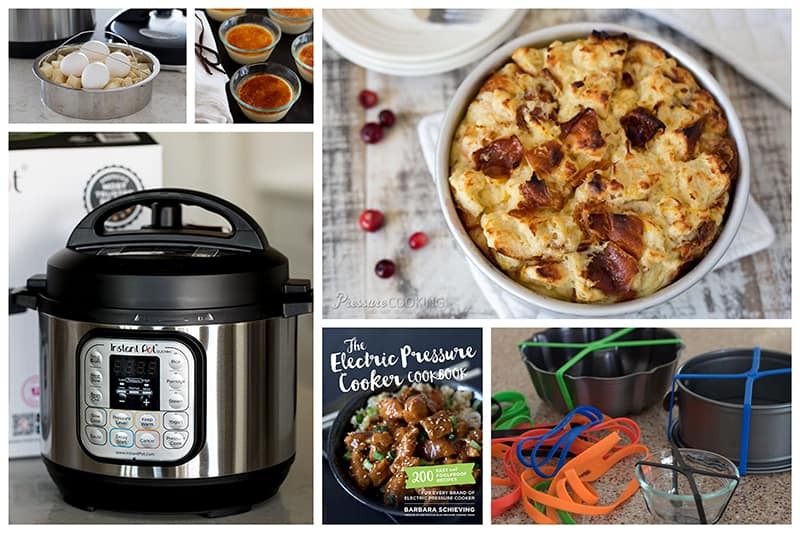 If you’re looking for ideas to put on your wishlist, or some fun ideas for gifts for the pressure cooker lover in your life, I’ve got you covered with this Electric Pressure Cooker Gift Giving Guide. This year I’m starting my gift giving guide with my favorite gift to give, my new pressure cookbook, The Electric Pressure Cooker Cookbook. It’s perfect for a beginner or the veteran pressure cooker user who’s in need of some great new recipes. There are pressure cooking accessories I use often enough that I consider them essential to pressure cooking. Most pressure cookers come with a rack/trivet. You’ll use a rack often when you’re cooking things you don’t want sitting on the bottom of the pressure cooking pot, such as cheesecake! If you want to try your had at my Chocolate Pots de Crème pictured above, you’ll need an additional rack. I’m also loving my 7 Inch Pizza Screen for double stack things like mini cheesecakes and creme brulee. Next, I recommend buying a steamer to keep the food up out of the water and to easily remove them from the pressure cooking pot. 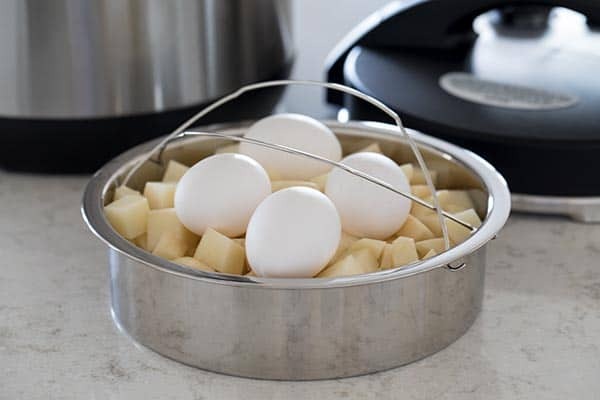 My favorite is the OXO Good Grips Stainless Steel Steamer. This Fagor basket is also great. The potatoes pictured above are cut for my popular Quick Pressure Cooker Potato Salad recipe. You cook the eggs and the potatoes at the same type. It’s so quick and easy, you’ll fall in love with potato salad all over again. You’ll want to have an extra silicone ring. The silicone gasket absorbs odors and if you want to cook something like cheesecake, it’s nice to keep an odor free gasket on hand. It’s also nice to have in case the gasket gets damaged – it’s rare when it’s new, but there’s been stories on Facebook about dogs, lids left on stoves. Two other must haves are a sling, and an instant read thermometer. These gift recommendations are not necessities, but they sure are fun. I’m crazy about this 7-Inch x 3-Inch Round Cake Pan, pictured above with my Cranberry French Toast. It’s also a great pan for cooking stack meals. Trying cooking Honey Sesame Chicken on the bottom and white rice on the top in the cake pan. I like to use a taller rack for stacked meals. And lately I’ve been using these Retriever Tongs a lot to get my cake pan out of the pressure cooker. A 6 Cup Bundt Pan. for making Pressure Cooker Pumpkin Chocolate Chip Bundt Cake, Steamed Carrot Pudding Cake, and even Stuffing in the Pressure Cooker. I use my Pyrex 6-Ounce Custard Cups to make Flan, Creme Brulee, and Egg Muffins in the Pressure Cooker. An immersion blender makes blending soups a breeze right in the pressure cooking pot. What about a second pressure cooker? The Instant Pot Mini is a fun 3 quart pressure cooker that is perfect as a second pressure cooker for side dishes. Or, it would make a great gift for singles, couples or a college student. Or, if you’ve been wanting a pressure cooker with a larger capacity. You can’t go wrong with the 8 quart Fagor or 8 quart Instant Pot. It’s been so fun to watch people fall in love with pressure cooking as much as I have. The Instant Pot Facebook Community group members really have fun with it. 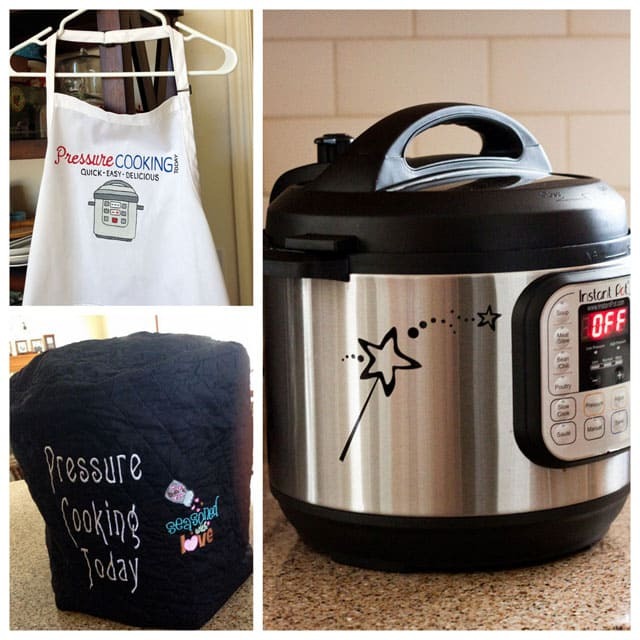 After seeing their electric pressure cooker covers, I couldn’t resist having Cindy custom make one for me. They’re also having fun with decals for the pressure cooker. I decided on a magic wand decal because the pressure cooker doesn’t really cook in an instant, but it still seems pretty magical to me. Renee from, Kudos Kitchen, sent me a custom made, hand painted apron that you could customize however you like and would make a great gift. Another gadget recommended in the IP Facebook group is a meat chopper for making quick work of breaking apart ground beef when browning it in the pressure cooker. That’s just a few of the new gadgets I’ve added to my collection this year, if you still want more ideas, check out my How to Get a Pan Out of the Pressure Cooker post, and my Best Pressure Cooker Accessories post. Be sure and join my new Electric Pressure Cooker Cookbook Facebook group. 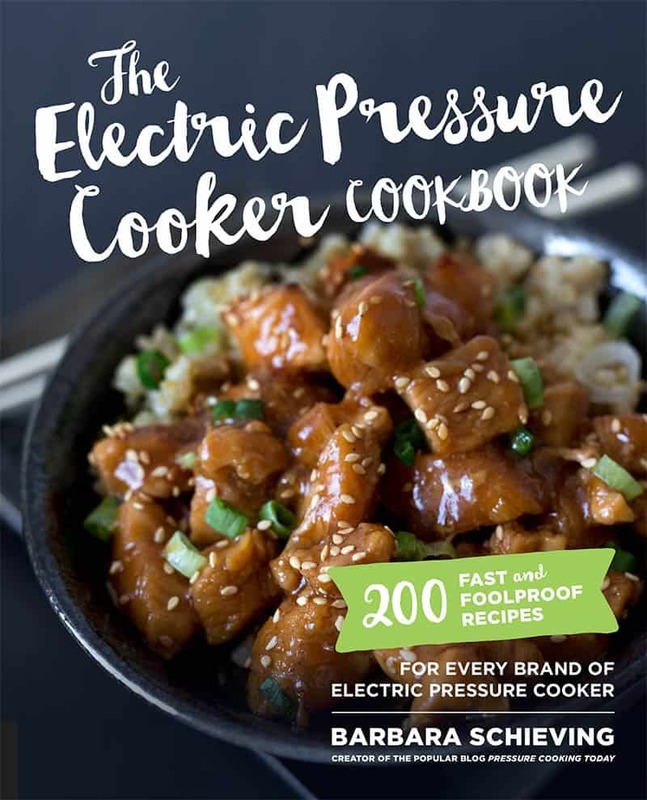 « Previous PostThe Electric Pressure Cooker Cookbook Giveaway! Love the different colored silicone slings. Where did they come from? Also, being from Canada, a lot of times I’m not able to get some of the stuff and/or the prices are majorly higher. Thank you. I thought the 2nd printing of the Mcookbook was gonna be done on Dec. 8th. Do you have a new date? I’ve ordered another one as a Christmas gift. I absolutely LOVE mine, I made the Italian sausage risotto for the second time last night. Delicious! Hi Marcia – I’m so glad you’re loving your cookbook! The cookbooks were delivered to Amazon on December 8th but Amazon hasn’t gotten them into their distribution system and started shipping them yet. The latest word is they will start shipping on Monday, December 18. Thanks so much for your patience. OK, you talked me into it! I just bought your PC book in paperback. I almost never buy cookbooks but yours is the FIRST site I check when I am looking for a recipe so I know your book’s recipes will work. I can’t wait to get it, it’s out of stock right now but I’m sure it will be in soon. I think I might have to pick up a few of these useful accessories too, especially the taller racks. I have yet to try the pan in pan cooking. That sounds like it would be really helpful, even though I have 2 IPs! Also, I love how engaged you are with your blog readers even though I am sure you are extremely busy. So many authors forget about their longtime readers once they become “famous”! 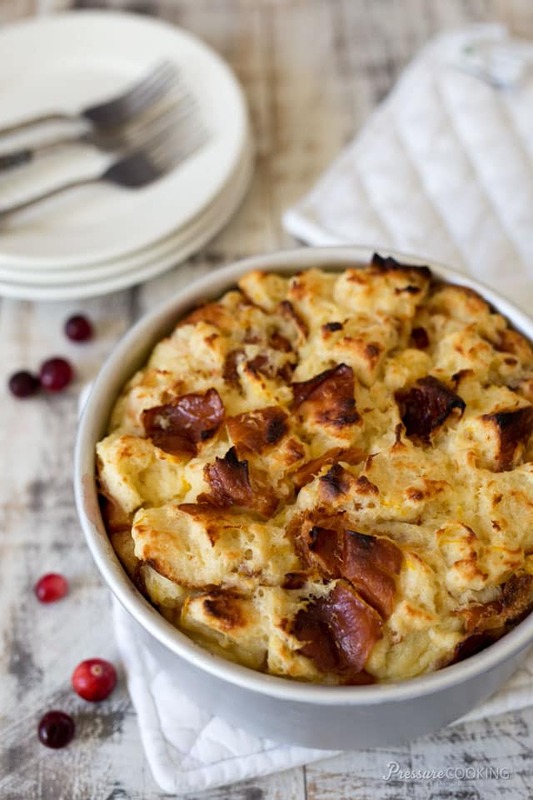 Thanks so much for your site, it is the best for epc recipes. Can you purchase a stainless steel pot for the pot that comes with the IP? I’m fairly new to the IP and thought I’d ask for some accessories for Christmas. So far I have an extra sealing ring, the Fat Daddio cheesecake pan, and the glass lid on my wish list. Sounds like a tall trivet would come in handy too. Can any pyrex or corning ware be used in the IP? I already have some round glass pyrex bowls of various sizes and some older corningware ramekins but want to make sure they are safe to use under pressure. Hi Angie – great choices. 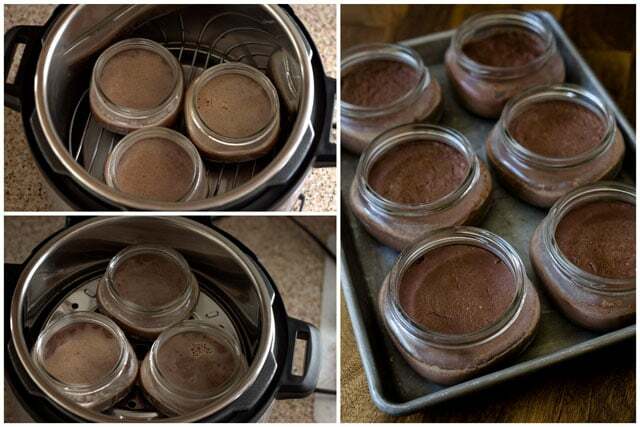 Yes, you can use any oven safe dishes in your Instant Pot. Have fun! I have a recipe for persimmon pudding that I have been making since the early 1990s, in an electric deep fryer that I kept around simply to use for the pudding when I make it. In the deep fryer, it takes 2-1/2 hours of steaming, adding more water about half way through. I found your recipe for carrot steamed pudding in the pressure cooker and am eager to try my persimmon pudding in my new Instant Pot, using your pressure cooker instructions. I have never had a pressure cooker before as one exploded in the school cafeteria when I was in grade school (early 1950s) and I have been afraid to even try one. I’ve heard they’re not so dangerous any more, so I bought one. This will be my first attempt at pressure cooking. Wish me luck, please. Hi Teddy – that sounds like a great plan to me. They’re super safe, quiet and not scary. You got this! I could not find an email address for you, so am asking in here. Is there a way you could convert it to a pressure cooker recipe. It sounds great. Hi Ann – You could cut the ingredients in half and give it a try in a 7 inch pan in the pressure cooker. Looks like a pretty soft cheesecake and it has an extra long cook time in the oven, so it will need a longer cook time in the pressure cooker, I would try half of the oven cook time. Let me know if you try it. Happy holidays! Thank Barbara, I sent the pan back as it was not he correct size. Will try as soon as I get the correct one. Again Thanks a lot. Suggested post–what I thought this post was when I first saw the title–a post about gifts to make and give using the PC. Vanilla, Limoncello, Dulce De Leche–whatever all else you clever cookers come up. Great suggestion Carolyn! I’ve updated the post with links. If you have any other ideas you’d like me to add, please let me know. Thanks! Barbara…..I took your photo awhile ago. I just bought an Insta Pot and it was fun to see your name as a contributor to the recipe book with a link to your site. Looking forward to trying your recipes! I just bought the glass lid for the cooker to use as a splatter control while sauteing items, an extra ring and the the Oxo steamer basket. I was thinking of getting some of the small pans you mentioned but I just checked and I have some white corningware and pyrex bowls which fit in the cooker. I guess I need to do a bit more “shopping” in my own kitchen before I buy more items. I have both a Fagor manual and an electric one. I find I use the manual ones much more often than the electric one. Maybe it’s what I am more used to, but I have several in different sizes, 3 qt, 4 qt , 6 qt and 8 qt. and they all get used. Hi Carol – definitely use whatever works best for you. What’s your favorite thing to cook in the pressure cooker?